Hunting has provided me with some of the best moments in my life. Whether I was solo or hunting with friends and family, the good times rolled and memories were made for a lifetime. 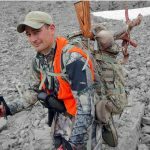 Reliving and re-hashing those memories is one of the great companion activities to hunting. I loved hearing the stories of trial and triumph from my family. Now my kids love hearing my stories and feel like they were there in the moment, even after the 500th time of hearing them. However, the stories mean so much more when there is a picture, or even better a video, to go with the story. Novagrade has made capturing video and pictures easier. In the early days I just stomped out the door with my weapon, some food, and some water. Like most of my generation, all my earliest trophy photos were taken with a fully rigor carcass hanging in the garage. As I got older, I moved on to disposable film cameras and ended up with blurry photos of the adventure in the field to go with the story. Film moved on to digital, and pretty soon half of my pack was filled with DSLR gear looking for that victory shot. Compact cameras got better, and my pack got lighter. Now we have phone cameras that amazingly rival early DSLRs for image quality. 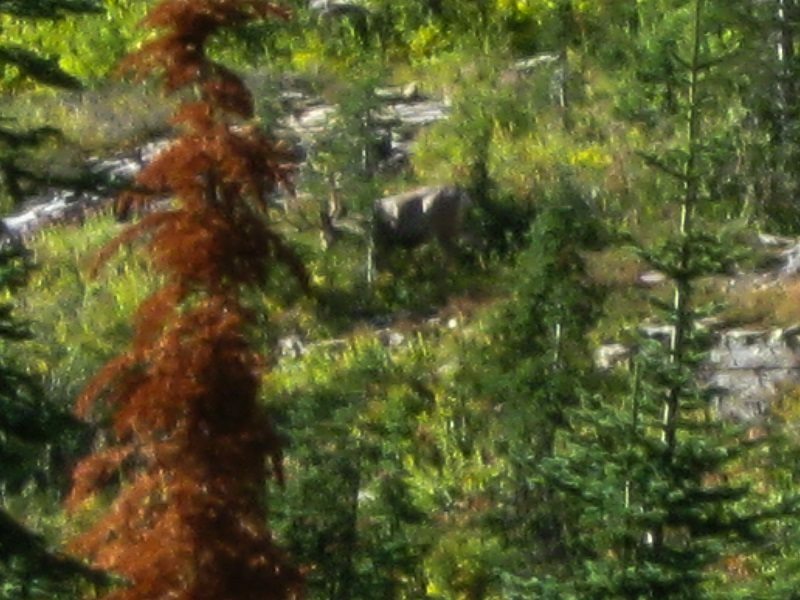 Somewhere along the way, I put that compact camera up to my binocular eyepiece, and suddenly had a blurry photo of the big buck that got away. Whoa, that was a game-changer. The next thing I knew I was googling everything I could about a new obsession: digiscoping. I was ordering all sorts of contraptions to somehow affix the camera to the optic. One thing I found out quickly was that digiscoping ease and picture quality took opposite trends in regards to sensor size. That is, as the camera sensor size increased the maximum possible picture quality improved, but the ease of getting that large sensor to work with a digiscoping setup got progressively harder. The DSLR gave fantastic results as a straight-up camera, but required precision and heavy gear to use in the field as a digiscoping setup. Autofocus was nearly impossible. The compact cameras (especially those with large 1″ sensors) rivaled the DSLR for image quality, but we’re also much easier to successfully attach to the optic. Their internally focusing lenses and on-sensor autofocus systems allowed the camera to fine tune focus from the scope’s image, and successful digiscoping became much easier under field conditions. As sensor size went down in those compacts, the general image quality went down, but boy did the small sensor make digiscoping easy. Cameras in smartphones had really small sensors, but just weren’t up to snuff in image quality—until recently. The latest crop of phone cameras is generally amazing. Through sensor and processing improvements, there are some that produce truly astounding image quality, while maintaining that tiny-sensor ease in digiscoping. There have been a number of adapters available for smartphones from various manufacturers that generally work by attaching a case to the phone that incorporates a cup that goes over the eyepiece of the scope. Now some of these allow for different adapter-cups, but they usually require their proprietary case for your phone, and a specific adapter-cup for your scopes specific eyepiece. Once you are set up with the proper case and adapter-cup for your phone, they work pretty well in the field. You simply press the cup over your eyepiece when you want, and everything is aligned and ready. The downside is, that you are restricted to your phone and your scope. 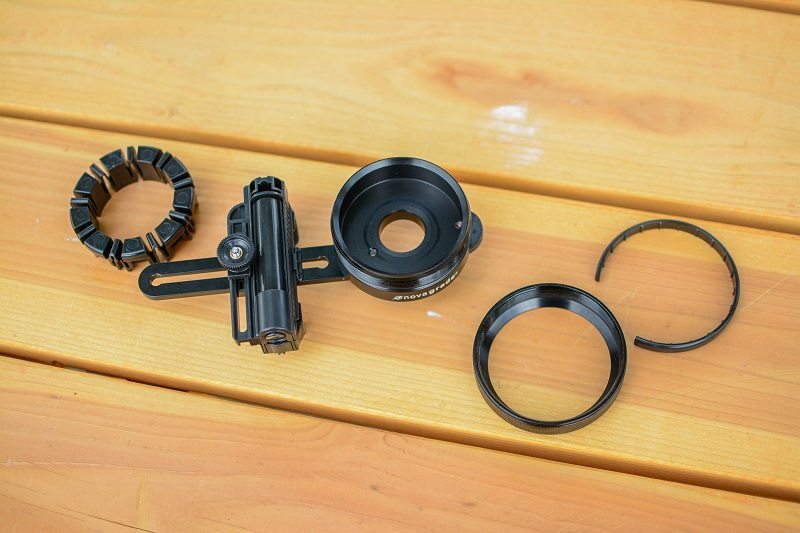 If you switch scopes, you need a new adapter-cup. If you switch phones, you need a new case. Furthermore, if more than one person wants to get pics or video with their own phone, they need their own case. This style of phone adapter is generally made of plastic and might not last as long as something more durably constructed as well. Novagrade adapters take a different approach. The Novagrade adapter is made of high quality milled aluminum and is anodized for all weather use and durability. It isn’t light and isn’t meant to be. My scale lists the Novagrade phone adapter weight at 8 ounces. For comparison, a standard style Meopta adapter I have for an iPhone 4 is only 1.5 ounces. The Novagrade adapter is truly universal. The consumer selects the compression ring that fits their eyepiece, installs it in the adapter and then slips the adapter over the eyepiece. 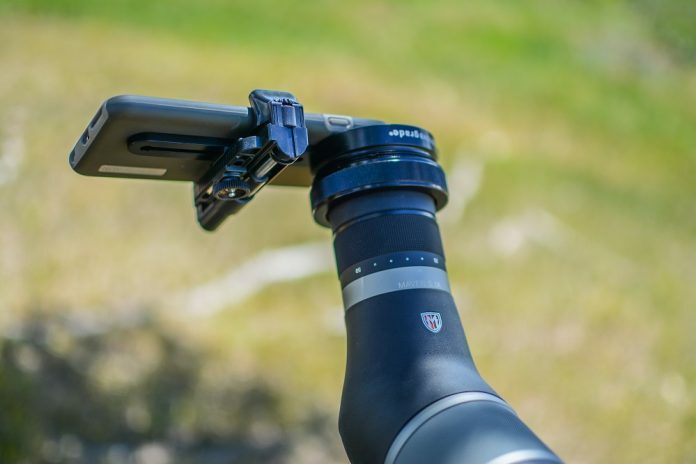 The user tightens the aluminum collar down, and the adapter is affixed tightly to the scope. The basic parts of the Novagrade Phone Adapter are engineered, machined, and assembled in the U.S.A. The adapter is easily adapted to just about any phone, whether it is in the case or not. I was able to adapt several different Apple and Samsung phones to my Swarovski ATX, and do it relatively quickly. There is one main alignment knob to adjust the X and Y axis to precisely place the camera lens in the aperture of the adapter. Small adjustment wheels are provided in grippers to fine tune the distance from lens to adapter. An end stop is fine-tuneable to keep the phone going to a repeatable spot when removing the replacing the phone. 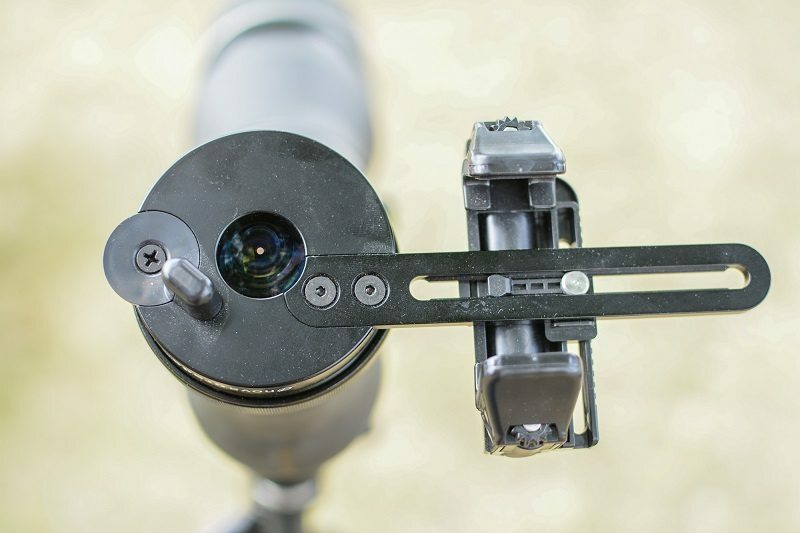 I used the Novagrade adapter for the spring bear, summer scouting, archery, and general seasons—and it came in really handy for my optics evaluations for Rokslide. The adapter spent every hunt in the pack, and stood up to the abuse. There is no doubt the level of construction of this adapter is much higher than the competition I have used. This is an instrument built for a lifetime of hard, versatile use. While I primarily used the adapter with spotting scopes, it can also be adapted to binocular use. The versatility really came to the forefront in my evaluation when I lucked into an early shipment of the new dual-camera iPhone 7 plus. The “telephoto” lens option on the 7 Plus meant I could totally eliminate vignetting without resorting to digital zoom, so long as I could get the second camera lens aligned with the optic. This proved exceedingly simple with the Novagrade adapter, as you can adjust the adapter to just about anywhere on the phone. No need to wait for a new case to be produced. I just adjusted the adapter and put it to work. The Novagrade does have a few downsides. As mentioned before, it weighs more than the competitors to accommodate its versatility and durability. For a phone adapter, a half pound is a lot. However, this is mitigated by those hunters that save weight by eliminating a separate camera and adapter altogether. 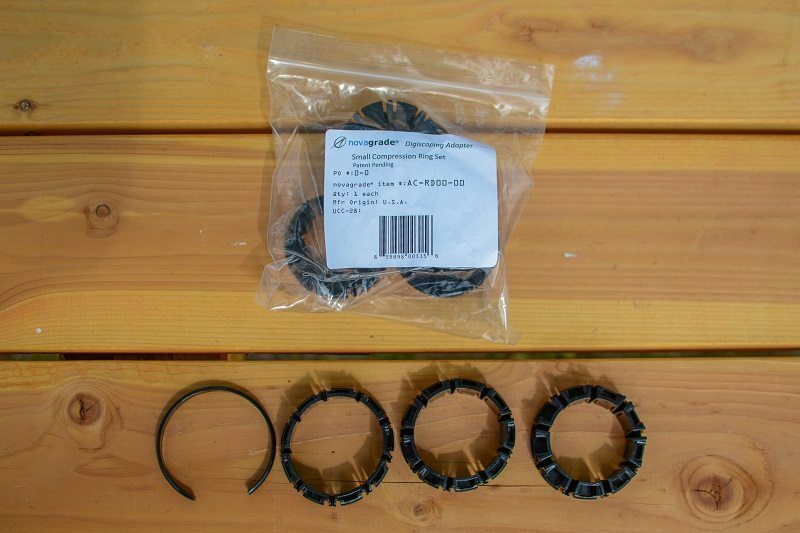 It is more expensive, at least initially, at a MSRP of $149.00 for the adapter and $23.00 for a compression ring set. However, there are no future costs as you can continue to use the Novagrade adapter with future phones and optics without additional cost, other than possibly buying new compression sleeves. The final downside is that the versatility of the system naturally results in some tolerances that make the system a little more finicky to get perfectly aligned than the competition that is designed for one phone and one scope. Novagrade recommends keeping the adapter on your phone for quick, easy use. However, I found that impractical, as I keep my phone in my pocket and use it as a backcountry GPS as well. I just dealt with a little bit of final adjustments when mounting the phone to the adapter, and it worked well for me. Overall, the Novagrade phone adapter does exactly what it was intended and it is the most versatile and durable option on the market. Hunters will have to weigh the advantages and disadvantages over the competition to see if the Novagrade adapter is right for them. I see the Novagrade as a big hit with those frequently changing phones or equipment, including guides that need that versatility for their clients and durability for hard, extended use. Those that use phones for professional digiscoping like journalists and outdoor filmmakers will also benefit from the adjustability and robust connection the Novagrade adapter provides. Here are my thoughts after some real field use with the Novagrade Double Gripper. It pretty much does what the original single gripper did that I talked about in my original review… only better. The extra gripper does aid in the repeatability of putting your phone in and out of the adapter compared to the single. The finicky adjustment issues when putting your phone into the adapter are pretty much eliminated. The Double Gripper otherwise has the very same top quality anodized aluminum build quality as the original and uses the same attachment mechanism. It is just as versatile for both the type of optic and the phone you shoot with. I sure like having the ability for two people to see the same spotting scope image in real time as well. The downside is that then Double Gripper swells the weight of the adapter to nearly 13 ounces with a collar in, as compared to the 8 ounces of the original. If the hunter wants the most durable, repeatable option, and is willing to haul the extra ounces, then the double gripper is a great choice. 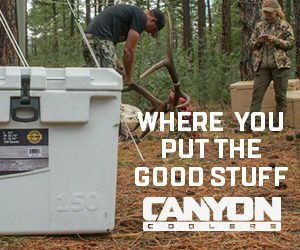 Want the same durability, but want to save the weight? The original Novagrade is for you. You can also have your single gripper converted to the double gripper for $20, click here for that option.